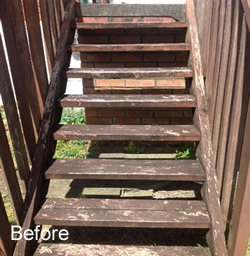 We use our own trademarked environmentally friendly products that you can't buy over the counter as well as fully insured, trained professionals who specialize in wood renewal. 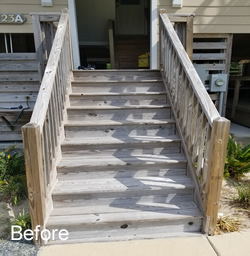 We are part of the largest wood refinishing company in the world and that experience is what sets us apart from all the rest with twenty years of wood renewal experience behind us! Once the surface is prepared, we apply outdoor wood stain mixed with our own trademarked sealer for the most durable product available. This powerful combination is non-toxic, gives extra UV and waterproofing protection as well as inhibiting future algae growth. It also vastly improves the surface from splintering. Why use our one of a kind, proprietary sealer? 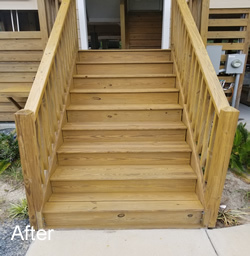 Because it literally locks the stain color into the wood, while binding and waterproofing the wood for the longest lasting product available on the market today. 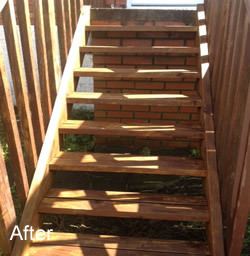 We are not just part of some giant franchise group jack of all trades service because all we do is wood renewal. We use only top of the line, quality products that last, not simply something you can buy yourself that won't hold up. Why is this important? 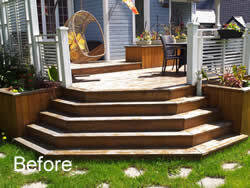 Because your deck, fence, gazebo, steps, and outdoor furniture will actually look good, and last so much longer. And maintenance? You won't need any! We would much rather have you simply enjoy your new looking products than worry about tedious maintenance. 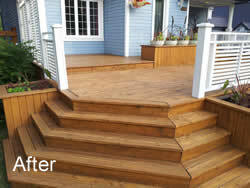 Choosing the right company for your outdoor wood renewal needs is simple. Is the company you are looking to hire wood specialists, with twenty years of experience behind them, with fully insured, professionally trained staff who care about the work they do? But as well, are they using specialized products and technology to give you the longest lasting wood renewal that is only available through them and no other company? That company and the right choice is Dr. DecknFence! We seal and stain your wood at the same time. No one else can do this!